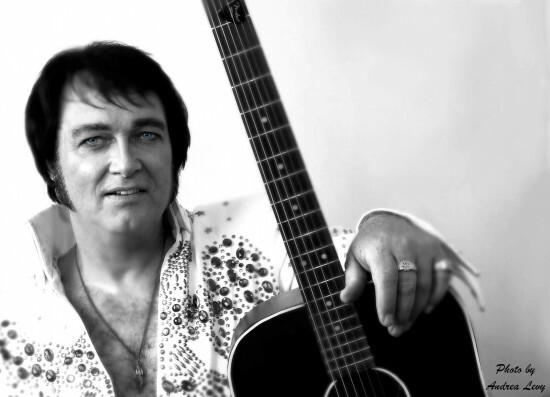 THE most sought-after Elvis Presley Tribute Artist in this part of the country, Greg Jaqua has been entertaining audiences in the United States, Canada and Europe tribute to "The King" for over a decade. Named "2009's Best International Elvis" in Porthcawl, Wales, UK, Greg delivers a fun, professional, family friendly show whether there's twenty-five people or twenty-five hundred. Greg is available for corporate events, private parties, festivals, car shows, and special events of all kinds. Past clients include Google, Air Tran Airways, American Movie Classics, Charter Communications, Michigan State Fair, The National Cherry Festival, The Charlevoix Venetian Festival. Very nice. Made the residents feel special. Great job Greg. Very entertaining, puts on an awesome show. Engages with the audience, loved it. "Thank you, Randy... Thank you very much!" We had a great time too! Greg was awesome and a consummate professional! I hired Greg from Chicago to pay a visit to my brother's b-day party in W. Bloomfield that we couldn't attend. The prearrangements where easy, he showed up on time. The family said he was funny and it was a great time. He gave me a follow up call after he left to let me know how it went. Outstanding JOB!!! Hire him for YOUR corporate events!!! We hired Greg, who was accompanied by his graceful assistant, Janice, for our corporate Christmas party at the TPC on 12/9/11. He did an outstanding show with an excellent long show - with a short intermission - and a second Elvis costume as well. He interfaced extremely well with all of our people and invited the crowd to get up, dance and even sing along at times. This is my second event that I hired him for and the first was a birthday party. He just does an outstanding job and his personality is just as great after the show too. He posed for pictures with our guest and was kind and generous at all times. Greg and his assistant Janice were wonderful. Very personable and professional. They worked with us on everything....Greg was very knowledgeable on Elvis facts and worked that into his act. He also knows how to read the guests and acts accordingly..I had a great time. I will recommend Greg for other events to all my friends and family. I found out he also is an ordained minister and people can have An Elvis style wedding right here in Michigan..
Greg did a spectacular job with the event. He not only did an awesome job performing, but added some great humor & connected with the audience well. We would absolutely recommend him to others!! He was a true professional and very accommodating to our schedule. Working with Greg was an incredible pleasure - from booking his services to hearing how successful the party was with his entertainment. I will absolutely consider him in the future for any of my entertainment needs - he dazzles. The first is Greg's favorite: "A Tribute To Elvis In The Movies." Featuring songs like "Girl Happy," "Kissin' Cousins," and "Devil In Disguise," just to name a few, this show highlights The King's 10+ years on the BIG screen. The second is EVERYONE'S favorite! It's Greg's classic Tribute to The King in Las Vegas. Classic songs like "Burning Love," "My Way," and "Suspicious Minds" are among the many favorites that make up this fun, fast paced, family friendly depiction of Elvis in the '70's at the peak of his career. Greg inter-acts and mingles with the crowd and hands out scarves in true Elvis style. From his real hair and side-burns, to his custom made replica jumpsuits, to his amazing voice - Greg Jaqua is the REAL DEAL! Plus....Greg is an ordained minister who can perform weddings "Traditional Style" or "Elvis Style" and give you the Royal Treatment on your special day! 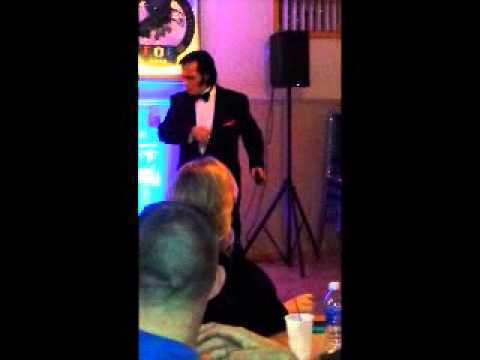 Greg is the most sought-after, full-time professional entertainer and Elvis Tribute Artist around. He delivers a show to accommodate all your requests! People love his voice, presence, personality and the way he interacts with the crowd to bring everyone into the show and on their feet. Your guests will be talking about Greg's performance long after "Elvis" leaves the building! We take great pride in providing the best show around. Greg will perform with soundtracks or with his live band. Your complete satisfaction with your event is very important to us as we Greg pride's himselves as he pays his Tribute to the King! Greg loves performing - and it shows! Greg Jaqua returned from the 2009 Porthcawl Elvis Festival in Wales, U.K. which he had the honor of being presented the Title - "Best International Elvis - 2009"!!! 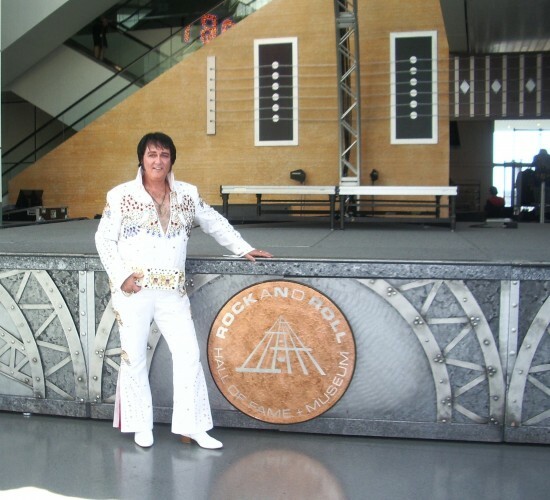 He has the voice, presence and warmth that portrays Elvis. He must be heard to be believed. His show is spot on! Greg is also an ordained minister who can marry "Traditional Style" or "Elvis Style" in all 50 states! Greg can perform your ceremony and his band can play at your reception if you would like a package deal! A man of many talents, Greg has worked the entertainment industry since his teens and has performed his tribute to the King since 1995. Besides being one of the best ETA's throughout the world, Greg is also a working actor and does voice-over and video work on a regular basis. He's also worked in the theatre, in the recording industry, and in Radio. Greg is based in Allen Park, Michigan (a suburb of Detroit) and is available nation-wide. Greg can perform by sound tracks or with a live band for the full concert experience! LIVE BAND! Available upon request at an additional charge. An equipment rider will be added to contracts for gigs requiring a live band. Various other requirements may apply according to client needs.